On Scotland’s Isle of Glenroth, the islanders gather for the Tartan Ball. On the guest list is American antiques dealer Kate Hamilton. Kate returns to the island where her husband died, determined to repair her relationship with his sister, owner of the island’s poshest hotel. Kate has hardly unpacked when a body is found, murdered in a reenactment of an infamous unsolved murder described in the novel—and the only clue to the killer’s identity lies in a curiously embellished antique casket. 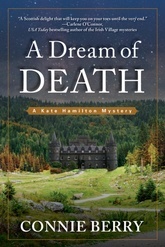 The Scottish police discount the historical connection, but when a much-loved local handyman is arrested, Kate teams up with a vacationing detective inspector to unmask a killer determined to rewrite island history—and Kate’s future.